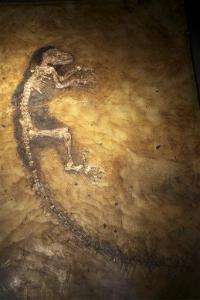 (PhysOrg.com) -- A 47-million-year-old primate fossil, a purported "missing link" between primates and humans, was unveiled this week in New York. The fossil, formally called Darwinius masillae but nicknamed Ida, could, due to it being an essentially whole skeleton, shed light on the construction of the primate family tree, says an expert on primate evolution at Washington University in St. Louis. Tab Rasmussen, Ph.D., professor of anthropology in Arts & Sciences, studies primate evolution by drawing on two major lines of evidence: the fossil record and the comparative study of living primates. One goal of this research is to trace the actual course of primate evolution. More importantly, detailed studies of primate evolution can provide insight into the evolutionary process itself. He has been particularly interested in major evolutionary transitions, such as primate origins and anthropoid origins. The new specimen of Darwinius is truly remarkable. Over the last 150 years of paleontological collecting around the world, thousands of fossil primates have been found representing many hundreds of species, but the new find is the first complete skeleton. Usually we are lucky to find a few fragments of jaws or teeth, or isolated limb bones. Only infrequently do we get partial limbs or multiple bones from a single individual. In Darwinius, we have essentially the whole skeleton, with impressions of body outlines and stomach contents as well. Some of the bones least likely to be found and properly identified from typical fossil sites are small bones of the feet, hands, fingers, tail, and so forth. In Darwinius, we can judge precisely the proportions and arrangements of these parts. Hands, feet and tail are critical for active arboreal movements, and Darwinius shows us that it had prehensile hands, powerful grasping feet, and a long, counterbalancing tail, all contributing to the efficiency of arboreal running and leaping. Because Darwinius died at a immature age, the specimen is also very helpful in reconstructing the life history of the animal. The sequence in which deciduous (baby) teeth and adult teeth erupt allows researchers to estimate the rate of development, whether an animal grew up fast like a rabbit, or slow like a human being. It turns out Darwinius had a medium growth rate, slower than most other mammals its size, but faster than modern apes. In this way, it was similar to squirrel monkeys and some lemurs. The individual represented by the new fossil had broken its wrist before dying, possibly from a fall. The stomach contents reveal fruit and leaves. Darwinius lived at a time (47 million years ago) not too long after the very earliest true primates appear in the fossil record. It provides us with the best look ever at such early primates. The world was much warmer then, and tropical zones extended far north into North America, Europe and Asia. The very widespread Eocene rainforests of the time held a remarkable diversity of primates. The Eocene was truly the golden age of primate evolution, judged by global diversity and abundance. Darwinius is also of interest regarding the construction of the primate family tree. Among living primates, there are three major groups. (1) Tarsiers are small, nocturnal primates of Southeast Asia, but in the past they were very diverse and widespread. One family of tarsioid primates, the Omomyidae, is well known from the Eocene. (2) Strepsirhini, or lemur-like primates, include nocturnal primates of Africa and Asia, and a considerable diversity of nocturnal and diurnal primates in Madagascar. The earliest members of this group are known from the Eocene of Africa. (3) The third group, Anthropoidea, includes monkeys, apes, and humans. Darwinius is clearly not closely related to the tarsiers or the true lemurs. It lacks any shared specializations with either of these groups that would provide evidence of a close evolutionary kinship. The authors of the report suggest that Darwinius may be a very primitive relative of anthropoids. The tie cannot be established with great confidence at this time. Among the very earliest primates known, Darwinius is a reasonable candidate as our earliest anthropoid kin. Another possibility regarding the evolutionary tree is that Darwinius is not specially linked to any of the lineages that live today. There is a good possibility that the true anthropoid ancestors lived in Africa during the Eocene. A large number of anthropoid fossils have been found there at younger dates. One of the main areas of controversy about Darwinius has to do with this hypothetical tie to Anthropoidea. Some researchers feel that early tarsioid primates are better candidates for anthropoid ancestry. Most of them favor an Asian genus called Eosimias as a potential anthropoid. One problem with this idea is that Eosimias is very poorly known, being represented only by teeth and jaws, so that hypothesis is still very insecure. Another problem is that tarsioid primates are very specialized in their limbs and skulls early in the Eocene, probably too much so to have given rise to more generalized anthropoids. Trying to reconstruct the earliest parts of the primate evolutionary tree is by its nature very difficult. This is because early primates were more primitive than modern ones. Also, fossil primates, even one as complete as Darwinius, cannot provide us with information about all anatomical soft tissues. It will not be possible to retrieve DNA from Darwinius. It looks like a small dinosaur to me.